Where do I use my Holland and Barrett voucher code? Choose the code you wish to use from NetVoucherCodes, copy the code and follow the link to the Holland and Barrett website. Select the items you wish to buy and add them to your basket. Once you have finished shopping go to your basket by clicking the basket icon at the top of the page. At your basket, you will find the 'Add Discount or Voucher Codes' box. Enter your code into the box and click ‘Redeem’. Your order total will be updated displaying any discounts. Holland & Barrett is your go-to place if you’re wanting to improve your diet and lifestyle for the better. It’s never too late to enhance your health so why not begin your journey today with Holland & Barrett. Here you can find a plethora of products designed to help improve your diet and lifestyle including Vitamins & Supplements, Food & Drink, Sports Nutrition, Weight Management, Beauty and much more. 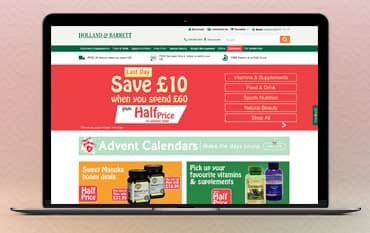 Together with excellent customer service both online and in-store, if you’re struggling to find what you’re looking for, you can rely on the helpful and knowledgeable team at Holland & Barrett to guide you in the right direction. Being a pioneer in the health industry, it’s no surprise that the Vitamins and Supplement selection at Holland & Barrett is second to none. You will only find the highest grade of ingredients at Holland & Barrett which are ethically sourced and kind to the environment. Find some of the nation's favourite products including Omega Fish Oil, Turmeric, Cod Liver Oil, vitamins D, B and much more. Shop the food & Drink section and uncover everything from Home Baking ingredients, cooking oils and sauces, Dairy products or dairy alternatives, and a bountiful section of Free From products including Milk Free, Wheat Free and Gluten Free foods and ingredients. If its sports nutrition or weight management products you’re in search for, you can find everything you need and more right here at Holland & Barrett including Protein Supplements, Meal Replacements, Fat Burners and much more. Discover a new you at Holland & Barrett and you can now join The Health Hub online to help you keep informed and inspired! Whether you’re looking for something in particular or browsing for products which will help enhance your health and wellbeing, Holland & Barrett is always keen to help cut the costs of those all-important essentials. Shop Half Price on selected items in the offers section and also look out for the Penny Sale. Get savvy with your online shopping and remember to look out for a Holland & Barrett voucher codes and offers at NetVoucherCodes where you could save a great deal of cash off your next purchase. With the exciting rewards scheme ‘Rewards for Life’ implemented by Holland & Barrett, You can get a little something back every time you spend money. It’s free to join and for each £1 you spend, you’ll get 4 points back. When activating your card, you will receive 150 points which equal £1.50 in credit and you will also be sent reward coupons to spend on anything instore. It’s time to start putting yourself first and with Holland & Barrett, you can do just that. With the exciting selection of Vitamins & Supplements, it’s easier than ever to begin your journey to getting your health in check with the superb range of products including all your favourites. Featuring all types of Vitamin capsules, Fish oils, Diet shakes, Hairburst Vitamins and so much more, finding everything you need to start improving your health can be found right here, all in one handy place. Holland & Barrett have proudly supplied the nation’s favourite selection of Vitamins & Supplements for over 150 years and continue to serve our needs. Don’t forget to keep a lookout for the Holland & Barrett Half Price sale or one of our Netvouchercodes Discount Codes. When it comes to nutrition, some of us have trickier requirements due to allergies and intolerances! Holland & Barrett now make it easier for you to find appropriate ingredients, snacks, foods and recipes with their ‘Free From’ range. Enjoy all sorts of exciting options with products free from Nuts, Milk, Wheat, Soya, Peanuts, Gluten and more! You can rest assured that with Holland & Barrett, you’re receiving is second to none but for your own safety, it is advised you read all packaging and labels carefully on each occasion before consuming and using products. Click & Collect: £0.95/Free on orders over £20 (order before 7pm for next working day). Parcel Lockers/myHERMES ParcelShop: £2.99/Free on orders over £20. Free 30-day returns policy, return items to a store, by post or via InPost Lockers. Holland & Barrett have store all over the country, to find your nearest store, use the store locator. Email: healthinformation@hollandandbarrett.com for health and product related queries, customerservices@hollandandbarrett.com for customer services. Write to: Customer Care Team, Samuel Ryder House, Barling Way, Eliot Park, Nuneaton, Warwickshire CV10 7RH. We are constantly on the hunt for first order Voucher Codes for Holland and Barrett to help you with your money saving. Our experts check dozens of sites for secret codes including NHS discounts, student sites & social media channels saving you time & money!